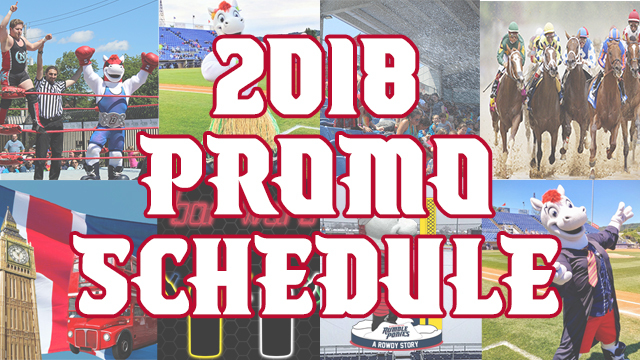 BINGHAMTON, NY - With Opening Day exactly five weeks away, the Binghamton Rumble Ponies are thrilled to announce their promotional schedule for the 2018 season. From April through September, NYSEG Stadium will be the place in the Southern Tier for affordable, family fun. The promotional schedule is chock-full of can't-miss events, highlighted by 15 fireworks shows, nine giveaways, a pair of spectacular appearances and two specialty jerseys. Individual game tickets for the 2018 season will go on sale at The Starting Gate Box Office on March 5 at 9:00 AM. "Last season the Rumble Ponies had the most giveaways, special appearances, and theme jerseys in franchise history," said Managing Director, John Bayne. "This season we are building upon that success and developing new and exciting events for our fans. Thanks to our Promo Madness contest in November, we heard directly from our fans and delivered a promotional lineup perfectly tailored for them." The Rumble Ponies are wasting no time diving into their promotions. The team will give away free fleece blankets to the first 1,000 fans to RumbleTown on Opening Night (April 5). Before the team opens up the season against the Portland Sea Dogs, the Rumble Ponies will feature live music starting at 5:30 PM. Fans will also get a taste of the first Thirsty Thursday of the season with 2-for-1 specials on select draft beers and fountain drinks. Fans will once again have the chance to vote on music featured during the Toyota Fireworks Series. On select dates during the season, fans will help choose the soundtrack based around a special artist. The Artist-Based Fireworks lineup includes Kelly Clarkson (April 6), Michael Jackson (April 20), Maroon 5 (May 25), Taylor Swift (June 1), The Beatles (June 22), Beyoncé (July 6), Billy Joel (July 20), Demi Lovato (August 3), Elvis (August 31), and Justin Timberlake (September 2). Other special fireworks shows include Star Wars (May 4), Patriotic (May 27), Christmas In July (July 21), Harry Potter (August 17); along with Big Bang Boom fireworks displays on Independence Day (July 4) and Labor Day Eve (September 2). Fans can expect to see two new traveling acts starting with Dakota and Friends Animatronic Dinosaurs (June 23) and David Smith Jr., The Human Cannonball (July 5). The Rumble Ponies will sport one-of-a-kind Do It For Daron "Purple Ponies" jerseys on May 4 and special Jurassic Ballpark Jerseys on June 23. Fans will also see some of their favorite theme nights from 2017 back, including: Alcohol Prevention Night (April 25) presented by Broome Opioid Abuse Council and Broome County Drug Free Communities, Purple Ponies Night (May 4) presented by Mental Health Association of the Southern Tier, Star Wars Night (May 27), Super Splash Day (July 18) presented by YES Safe Choices, Olum's Furniture Frenzy Friday (July 20), Christmas In July (July 21), Country Music Night (August 2), 2nd Annual Bar Wars (August 14), Irish Night (August 16), and Harry Potter Night (August 17). The Rumble Ponies have also added the following new promotions that are sure to be fun for the entire family: Mascot Mania (April 27), Derby Day featuring a Guaranteed Win (May 5), Spiedies Night (May 26) presented by Lupo's, Pirates and Princess Day (June 3) presented by Mix 103.3, British Invasion Night (June 22), Jurassic Ballpark Night (June 23), Superhero Sunday (July 8), New York, New York Night (July 20), STEM Day (July 22), Visions Cup presented by Visions Federal Credit Union (August 18), and Sandlot Night (8/31). The Rumble Ponies are proud to hold a Big Brothers and Big Sisters Day on Saturday, July 7 in honor of the late Marion O'Connor. In December of 2017, the Rumble Ponies received a donation of $195,159 from O'Connor. The long-time Binghamton baseball fan posthumously gave back to the organization as a way of thanking them for installing a handicapped lift at NYSEG Stadium which allowed her and her brother to attend games and create some of their fondest memories together. Mss. O'Connor's gift speaks volumes about the mission of the Rumble Ponies; providing families the chance to create memories at the ballpark that last a lifetime," said Binghamton Rumble Ponies owner John Hughes. "We are honored to remember Ms. O'Connor and her brother through our Big Brothers Big Sisters theme night." As part of the festivities, the team will have a specially designated Brother and Sister ticketed section in the ballpark for the night, along with a special pre-game siblings catch on the field. The team will also have sibling duos square off in all in-game promotions throughout the night. For the entire promotional schedule please visit www.BINGRP.com. The Rumble Ponies kick off the 2018 season at home on Thursday, April 5 against the Portland Sea Dogs (AA-Red Sox) at 6:35 PM. Individual game tickets go on-sale at The Starting Gate Box Office on March 5th at 9:00 AM.